LordsArt is proud to offer a line of Christian apparel that makes it easy to display your faith to everybody you come into contact with. Matthew 5:16 says, "In the same way, let your light shine before men, that they may see your good deeds and praise your Father in heaven." It pays to advertise and that is true in our Christian walk as well. We carry Christian Tees for men, women and children as well as Christian golf shirts for men and V-neck Christian tees for women. Look for our special offering of GardenFire Christian tees. Shop for Christian pullover and zipper Hoodies. Browse our site for Christian Crew Necks and long sleeve tees for both men and women. We offer Christian Headwear, Christian Baby Clothing, Christian Flipflops, Sunglasses and much more. 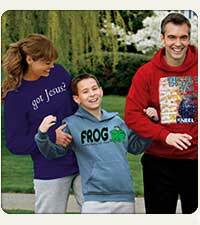 Honor the Lord Jesus Christ with what you wear and look great doing it with Christian apparel from LordsArt.